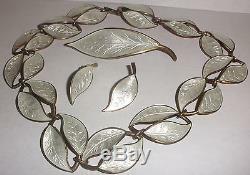 Vintage David Andersen Norway Sterling Silver white enamel large leaf necklace approximate 16" , bracelet approximate 7.5" , brooch approximate 3", 1.25" approximate earrings set. NO CHIPS CRACKS OR REPAIRS. PLEASE SEE THE PICTURES FOR CONDITION AND JUDGE FOR YOURSELF. White spot from camera flash not on the brooch. ITEMS I SELL ARE NOT BRAND NEW AND DO HAVE WEAR EXPECTED WITH THEIR AGE... The item "David Andersen Norway Sterling Silver 925s necklace bracelet earring brooch set" is in sale since Saturday, May 20, 2017. This item is in the category "Jewelry & Watches\Vintage & Antique Jewelry\Vintage Ethnic/Regional/Tribal\Scandinavian".